We are the ISO 9001:2008 certified manufactures and exporters of UPVC Tee, we are engaged in manufacturing and exporting a superior quality range of UPVC Tees. The tees offered by us are manufactured using strong raw material, which ensures their sturdy construction and longer life. - 3/4 x 3/4 inch. - Size: 15 mm x 1/2" - 50 mm x 1"
With an objective to fulfill the ever-evolving demands of our clients, we are engaged in offering a wide assortment of UPVCPlain Tee. 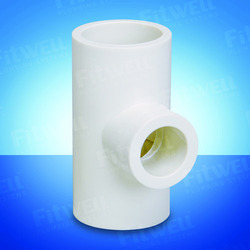 Our company is widely appreciated for providing UPVC Tee to the clients. 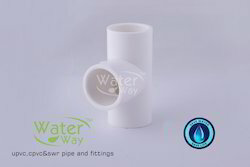 This product is extensively used in irrigation and municipal water supply system along with petrochemical industry. UPVC Tee is manufactured by making use of optimum-grade raw material and basic components with the help of modern technology. Available sizes: 63 mm to 160 mm as per IS 14735.